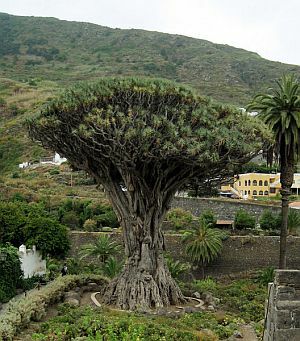 The main claim to fame of Icod de los Vinos is, of course El Drago, or the Dragon Tree, but more of that later. The town was one of the first to be established after the Spanish Conquest of 1496. Today, it is a lively, bustling community with good shops, a fair few sights to see and even a decent beach! The town is situated on an extensive sloping area, beginning up at the edge of the pine forests and extending right down to the sea. As it is surrounded by lush, fertile plains, its main industry was (and still is) agriculture, producing crops of bananas, potatoes, cereals, vegetables and fruit. 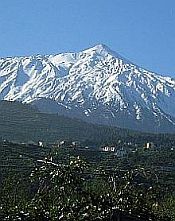 One of its main areas of activity is wine production and the vintages bottled there are given the Denomination of Origin Ycoden-Daute-Isora. Down on the seafront, at San Marcos Cove, much commercial fishing takes place. This festival is celebrated on the evening of the 29th of November in several towns in the vicinity. The next day is the feast day of San Andres, the patron saint of Tenerife and Icod de los Vinos makes the most of it in characteristically odd Tenerife fashion. The townspeople make wooden sledges (yes, honestly) which they wax throughly and then...you guessed it...ride down the streets. As the town is built on a hill and the streets are sloping at an unbelievable angle, you can imagine that this is a particularly hazardous thing to do. The practise (known as Arrastre de las Tablasa, or 'riding the boards') rose originally from the 17th century transportation of the town's wine to the harbour for export. Sledges were used and the tradition stuck. These days, rather than wine, you see the younger members of the town community trying to outdo each other as to how fast they can go. Needless to say, they have the Red Cross standing by! Another aspect of the celebrations - and in the same vein - is that the new wine is finally ready and everyone present is expected to partake. You'll be expected to drink a toast to the patron saint, your wine accompanied by a bag of hot, roasted chestnuts, or a marinated pork kebab. 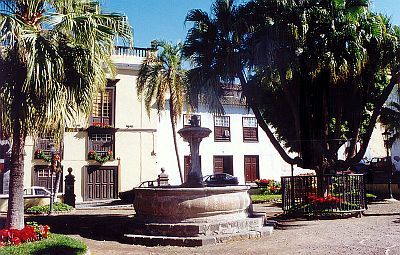 One of Icod's - and, indeed, Tenerife's - most famous landmarks, this huge tree is situated near the Plaza de Lorenzo Cáceres. Although it is said to be over 1000 years old (accounting for its full name El Drago Milenario), in reality, it has probably only been standing for some 500 years. Even that is a pretty long time! It is possible to take a mini-train ride that takes you on a tour of the town and then to the small park housing the Dragon Tree. The fee for this is 3 euros. This is a tropical garden near to the Dragon Tree that houses hundreds of different exotic species of butterflies, all flying freely among the visitors. Entrance fee is about 5 euros. Meaning the "Cave of the Wind", this is a labyrinth of underground tunnels formed by the island's volcanic activity. Covering over 10 miles, it is the longest volcanic tunnel in the world.